India Inc. Founder & CEO Manoj Ladwa tracks how India has driven its auto sector on to the road of global success. Even as you read this piece, there are at least 1,500 passenger cars and 6,000 motorcycles being loaded onto ships at some Indian port for export to the Middle East, Africa, Europe and even the US. The badges they wear read like a veritable who’s who of the international auto industry and include such marquee names as Toyota, Ford, Volkswagen, Suzuki and Renault among cars and Honda, Bajaj and Hero MotoCorp among two-wheelers. And I haven’t even mentioned tractors, heavy, medium and light commercial vehicles, three-wheelers and a host of complex and simple auto components. Over the last three decades, India has developed a very robust domestic automobile sector where the world’s largest and most popular brands jostle for market share with home-grown auto majors such as Tata Motors, Mahindra & Mahindra, Bajaj Auto Ltd and Hero MotoCorp, among many others. Today, it is not uncommon to find consumers in the most developed countries in the world driving around in Made in India vehicles. Yes, a vast majority of these vehicles carry the brand names of US, European, Japanese and South Korean companies but make no mistake – each of these cars has been assembled by Indian technicians in Indian factories and mostly with components that are not only made in India but also designed at R&D labs in that country. Then, it took an Indian enterprise and billions of dollars of Indian investments to restore and renew the glory of iconic British car maker Jaguar Land Rover and revive its fortunes. Another Indian multinational, Apollo Tyres, too, has recently invested about $500-million in a plant in Hungary, its second in Europe after the one in the Netherlands. 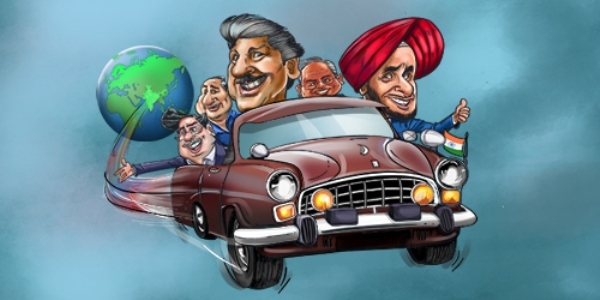 All these examples show that the Indian automobile industry is now fully integrated into the global supply chain – and a source of both components and kits as well as fully assembled vehicles to assembly plants, OEMs and showrooms around the world. In this issue of ‘India Global Business’, we celebrate the global success of this indigenisation effort with our cover story titled ‘Picking up speed’ not only because it is, arguably, among the most successful Make in India initiatives but also because of the lessons it holds for the Narendra Modi government’s efforts to transform India into a global manufacturing hub, which is a precondition to providing new jobs to the millions of young Indians who enter the country’s workforce every year. The beginnings were small, mostly unheralded and, as is usual with most path breaking economic initiatives in India, widely criticised for opening up the Indian market to foreign players. Note the similarities with the Modi government’s efforts to build a domestic defence-industrial base in India and its efforts to position India as a global electronics manufacturing hub. From those small beginnings in the early 1980s, when a handful of Japanese car and two-wheeler makers set up plants to assemble a few thousand units of their vehicles a year from completely or semi knocked down kits imported from their mother countries, India slowly, and organically, developed a local vendor base to bring down the import component in these vehicles to globally acceptable levels and even developed the knowhow and “know why” to be able to develop not only components but complete cars and bikes within the country. Today, India makes more than 3 million passenger cars and close to 20 million two-wheelers and exports more than half a million of the former and about 2 million of the latter. China and before it the South East Asian Tiger Economies all followed this approach when they set out to conquer the world of business at various times in the last century. India is a late adopter of this approach but, as its success in the automobile sector shows, has the necessary wherewithal, including the scientific base and manufacturing capabilities, to replicate this success in other complex engineering sectors. There are reports that India is considering issuing licenses for the assembly of F-16 or SAAB Gripen fighter planes in India if their parent companies agree to replicate their domestic eco-system of vendors and developments in India. The same is also happening in the case of submarines and artillery guns and small arms. These initiatives, too, will have to start with limited initial ambitions. But if they are nurtured well and seen through to their logical end, we could well see Made in India fighter planes flying with NATO and Japanese colours one day and consumers in my home country, the UK, speaking on mobile phones and advancing their careers with computers and tablets assembled by an Indian company in England. Meanwhile, apart from our in-depth feature on the Indian auto sector, there is a usual wealth of material on India’s global march in the pages ahead of this edition.